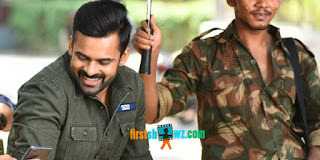 Supreme Hero Sai Dharam Tej’s Jawaan film pre-look will be unveiled on June 8th while the film is expected to hit the screens soon, as the shoot is nearing its completion. While Sai Dharam Tej will be seen in the titular role as a patriot, Mehreen Pirzada plays his love interest and Tamil actor Prasanna plays the negative lead. B V S Ravi is donning the director cap for this emotional entertainer, which is being produced on Arunachal Creations banner. S.S Thaman is the music composer of the movie. Sai Dharam Tej has undergone special training for the look of the movie.